The Future of File Delivery is Here…And It’s Free. We are proud to announce the release of our newest feature that is going to save everyone on our platform a significant amount of time, effort and money when it comes to delivering music and metadata updates to agents, partners, and sub-publishers. Introducing the new SourceAudio Agent Delivery Tool, a standard feature now available within every SourceAudio site. No more paying for each partner/sub-pub, no more paying for each of your partner's setups, and no more paying for file transfer. With this new tool you can quickly and easily send your music and metadata -- from your entire catalog or just individual release updates -- to any partner on SourceAudio, for free. We still support the delivery of formatted music & metadata to any third party system for $249/TB of transfer, but with this new tool you could soon be delivering all of your new music updates 100% for free! 1. Host your music and metadata on SourceAudio. Full-featured hosting plans begin at $29/mo. Limited-use agent delivery sites are FREE. 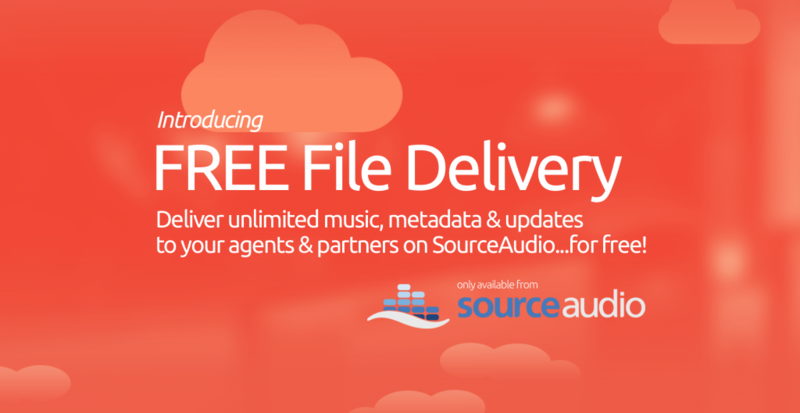 If you're already hosting your catalog on SourceAudio then you're ready to start delivering for free today! 2. Contact any SourceAudio representative to let us know which SourceAudio site/partner you'd like to connect with. We will make the connection between your two sites and you'll be set to start delivering files. 3. Visit your new "SourceAudio Agents" tab within the File Delivery section of your Admin panel. Select the partner/agent/sub-pub you want to deliver your music to, then select from a list of your recent album releases or entire catalogs and labels to send selected music and metadata to your connected partner. Once sent, your connected partner will receive an email notification letting them know that you've pushed new files to them. The recipient then goes to the new import tab on the upload section of their site to import your music and manage the metadata. Just like any other time you've delivered files via SourceAudio, your SourceAudio-to-SourceAudio deliveries are stored in your Delivery History tab so you can see which files you've sent to each of your partners and when you sent them. » Refer a New Agent/Partner and Each of You Get an Extra Month of Hosting for FREE! We just launched our 500th site on the platform last month so chances are your agents and partners might already be using our platform as we speak -- and you can deliver files immediately to any of them for free. If you have other Agents and Sub-Publishers who aren't yet on SourceAudio just send them our way and once they get past their free 30-day trial you'll each get an extra month of our regular hosting service for free! There's no limit on the number of new referrals you pass our way and we'll give you a free month for each and every one. So go ahead, deliver away!